While SAKO has created an official SAAMI 6PPC round, called the 6PPC USA, most of the 6PPC shooters in North America are running tight match chambers cut with custom reamers. There will be variations from one reamer to another, enough so that custom dies are generally recommended for match guns. Here is a Dave Kiff reamer used by Speedy. He prefers a .263" neck because that works better than .262" when he needs to use his tightest bushings to get more neck tension. There are three basic methods to form 6PPC cases. Method 1--Fire-Form with Pistol Powder, No Bullet: With this method, you load a case with pistol powder, seal the case mouth with wax or modeling clay, and then just shoot off the charge. There are many variations on the theme, using different loads of powder and various fillers, but we suggest just loading the case with Bullseye up to the neck, top with wax (NO BULLET of course! ), and forget the fillers. This will produce very consistent cases, particularly if you use a dedicated fire-forming barrel with .002-.003" shortened headspace for a good crush fit. It's sensible to set up the fire-forming barrel with a no-turn neck, so you can neck-turn after fire-forming. If you are using a chamber with normal headspace (such as when fire-forming with your match barrel), we recommend you run an expander down the neck to get an outside diameter just equal to the chamber size. This helps with crush fit, and seals the chamber, reducing blow-by. For example, if you have .010" neck thickness, and a .262" neck, you want to expand the neck inside diameter to .242" (after springback). Since there is no bullet in place, the case-neck will go in the chamber even with this tight clearance. Note: you can buy expanders in various diameters, but you may have to turn down the diameter slightly to get just the right amount of expansion. WARNING: NEVER USE the FIRE-FORMING PISTOL POWDER in YOUR REGULAR LOAD WITH BULLETS--THIS CAN BE EXTREMELY DANGEROUS!!. Method 2--Fire-Form with 6mm bullet and Full Load: The second method is to fire-form with a 6mm bullet in place using your regular rifle powder. To save wear on your precious match barrel, again, this can be done with a dedicated fire-forming barrel. It's fine to use a "throw-away" PPC barrel that has lost its accuracy, but you want to make sure the chamber is the same as your match gun, or your fire-formed rounds may not fit. 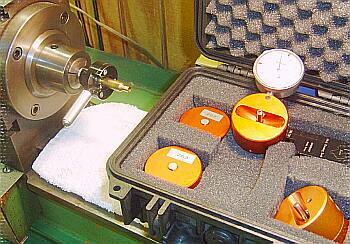 You expand the brass with a 6mm expander, then turn the cases to fit your chamber. (You may wish to leave the very end of the neck a couple thousandths larger than the rest of the neck so you get a crush fit--you can then make a final neck-turning pass after fire-forming). Load a full charge, seat the bullets into the lands, and shoot. After initial fire-forming you'll want to shoot the cases one or two times in your match barrel to get a final perfect fit. Most shooters will then uniform the primer pockets, and some will ream the flash holes. Some shooters like to do a final neck-turning pass after fire-forming. Once you do the case prep you prefer, the cases are ready for competition. Method 3--Load with .222 Bullet in 6PPC Chamber: The third method, loading a 220 Russian normally and shooting it in a 6PPC chamber, is less well-known but reportedly works well. Start with a 6mm fire-forming barrel chambered like your match barrels. You simply take the 220 Russian case, fill it with a normal charge of rifle powder (H322, Benchmarks, VV N133), and seat any inexpensive .222 bullet. Chamber the round and fire. This will blow the shoulder forward and expand the neck to your exact chamber dimension. The .22-caliber bullet just sails down the oversize bore (don't use your match barrel for this!). Reports are that this results in very uniform necks. After fire-forming, expand the neck and turn to your desired diameter. The only negative in this process is that you will be wasting bullets, so use cheap ones. Also, you'll need some kind of .22-caliber seating die. By contrast, with the no-bullet/wax-plug method you can basically fire-form at the bench with no tools other than a primer seater and a powder dipper. Thanks to K. Highfield of Sydney, Australia for this tip. If you think this seems like a lot of work--you're not alone. If you're short on time or don't want to mess around with fire-forming, you can purchase processed 6PPC brass from a variety of sources including Bruno Shooters Supply, and Hoehn Sales. Back when he was running S.G.& Y., Hall-of-Famer Speedy Gonzalez had a dedicated lathe for neck-turning PPC brass (photo at right), with a collection of pre-set Nielson "Pumpkin" neck-turning tools. With this kind of equipment, you can neck-turn a large number of cases very quickly to very precise specifications. We've found the neck consistency of lathe-turned brass to be superior to what most shooters can produce with hand neck-turning tools--unless they have many seasons of practice. Brass and neck-turning images courtesy Speedy Gonzalez. The most popular 6PPC powders for Benchrest are: Vihtavuori N133, H322, and Benchmark. N133 is now used by most 6PPC competitors, with H322 second, and Benchmark a not so close third. Among the top fifty shooters at the 2004 Super Shoot, N133 and Federal primers were used by a large majority of the competitors. Historically, IMR 8208 (aka "Thunderbird") powder may be the best of all--many shooters feel it shoots well in nearly all conditions, so well that you can get by with the same load in most locations. Unfortunately, Thunderbird is no longer sold. Jackie Schmidt notes: "With the demise of the legendary 'unobtainables', ("T", Scottish 322, Thunderbird, old 2015), N133 has certainly become the powder of choice." While many feel Benchmark is a little too slow in burn rate, N133, H322, and Benchmark can all deliver outstanding accuracy. With all three powders, most first-rank shooters "load to the conditions" to eliminate temperature-induced variations. Benchrest competitors definitely "hot-rod" their cartridges, pushing them to the max given the conditions. Still, with the good Lapua Brass, 6PPC shooters can often make 100 pieces of brass last an entire shooting season. The elite shooters, however, usually prepare a new set of brass for major matches. Speedy tells us, "With the amount of time and money expended attending a major match, the cost of a new set of brass is insignificant. Before a big shoot, I'll fire-form 50-100 pieces in a separate barrel, then shoot each case once in my comp gun, and then they are ready for match use." Loading Strategies--Should You Load on the Bench? The majority of top 6PPC competitors still load their ammo on match day, playing with load weights in an effort to suit the charge to ambient temperature and humidity. While this allows you to get peak velocity on a cool day, and avoid over-charges in very hot conditions, loading at the bench is also a huge distraction, and you may find that on-site loading really isn't essential to success. Hall of Famer Jim Borden observes, "I have my ammunition already loaded for [major matches]. It seems to be working as both my rifles are consistently Agging in the low Ones. That's with a load of about 29.0gr N133, running about 3300 fps." Why does Jim pre-load when most competitors try to load to conditions? Jim answers: "Loading to conditions on match day can kill you. All you can do is go by memory and guess-timates. I've found if your rifle has good vibration control, you'll typically have an accuracy window of 100-125 fps. So I set my preloads for velocity in the middle of the accuracy window and that lets me shoot in any conditions. Studies by Jack Jackson convinced me we could let ammo sit for as long as a year and the accuracy will hold." For competition, almost all 6PPC shooters are using 60-70gr match bullets from custom bulletsmiths such as Lester Bruno, Ronnie Cheek, Allie Euber, Jef Fowler, Don Gentner, Brady Knight, Randy Robinett, and Bart Sauter. Bart Sauter's Ultra bullet has proven extremely successful, and Col. Billy Stevens used Ultras to win the 2005 Super Shoot. But there are many great bullets that can win. Lester Bruno was the 2004 Shooter of the Year, and he credits much of his success to his innovative boat-tail bullets: "I won the first match I shot with the new Bruno Boat-tails, and from then on I was consistently placing higher than ever before. 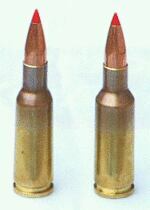 I really believe that, more than anything else, switching to these bullets was the main reason I did so well in 2004". What's new on the bullet horizon? 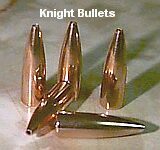 Well both Brady Knight and Zia Bullets (now marketed by Bart's) have produced some 58gr bullets that are quite promising. The smaller bullet does offer both higher velocities and slightly less recoil." But at the 2005 Super Shoot, Bart's Ultras were still the clear favorite among 6PPC bullets. Varmint shooters can utilize a wide range of 6mm bullets from 50 to 90 grains, but we think the 6PPC does best with bullets under 80 grains. The 58gr and 65gr V-Max shoot great from a 1:14" twist barrel, but Varminters may find a 1:12" barrel more versatile, as this can handle the heavier Varmint and hunting bullets, such as the 75gr V-Max. Most top 6PPC competitors run their ammo at pretty high pressures. Such pressures demand that cases be full-length sized each time they are loaded. But the trick is sizing the case just enough to allow proper feeding/extraction and no more. To achieve this perfect fit, nearly all the "top guns" use custom dies, precisely fitted to the dimensions of fired brass. Typically, a custom sizing die will reduce the case diameter at the shoulder .00075" to .001". The die will also allow for a little bit of shoulder bump. Nearly all the top shooters use bushings for neck-sizing. Having a variety of bushing allows you to compensate for brass that becomes work-hardened. You can also use bushings to tune loads for different bullets or conditions (tighter "grip" tends to increase pressure). For his .263"-necked brass, Speedy Gonzalez has a full set of carbide neck bushings, in .0005" increments from .256" to .261". He also has four different body-sizing dies, which allow him to choose the exact amount of sizing he wants, both at the shoulder and at the web. Most of us can't afford such a collection of dies, so you want to start with a good basic full-length die that brings in the shoulder a little less than one-thousandth. To check if your die is sizing properly, measure the diameter of a fired case right at the base of the shoulder and lock the calipers. Then run the case through the full-length sizing die. Put the calipers back on the sized case and then slide them down. The calipers should slide one-quarter to one-third of the way down the case. If the calipers can slide to the middle of the case, your die is sizing too much. 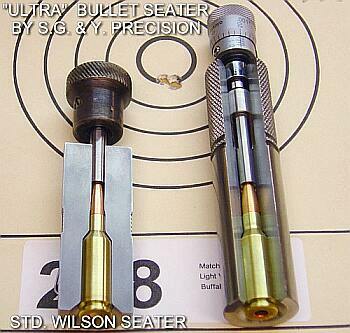 For bullet seating, hand dies used with an arbor press are favored by most 6PPC competitors. Wilson makes an excellent stainless micrometer-topped seating die that will produce excellent ammo with low run-out. For the ultimate in accuracy, you can have your gunsmith use the chamber reamer to create a true custom seater die. If you are going to the expense of a custom seater, it is worth fitting the die with a micrometer top. This makes it much easier to control seating depth. If there is a standard configuration among 6PPC rifles it is a 20-22" Heavy Varmint or Light Varmint taper barrel, 1:13-1:15" twist barrel, with a .262"-.263" Neck chamber. At the Super Shoot many of the best shooters favored a 13.5 to 13.7 twist. 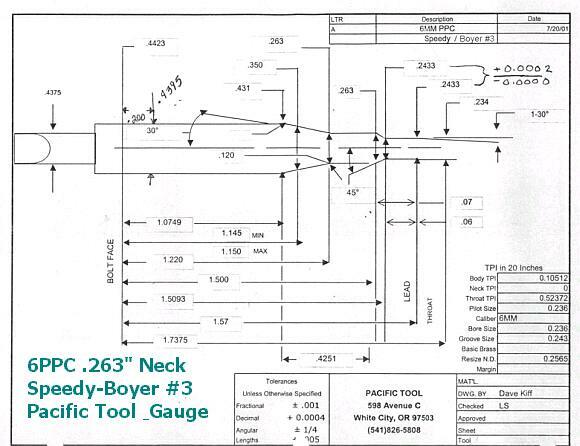 Most 6PPC shooters believe a .262" neck gives the best accuracy. However, Mike Bryant has built some very successful 6PPCs with .265" necks, and many notable shooters are experimenting now with .268" necks. That still requires neck-turning, but it can be done in one pass. Turning brass for a .262" chamber usually requires two or three passes for the best results. There is increasing interest in a "no-turn" 6mm PPC among varminters and club-level competitors. Gene Beggs and others have found that a no-turn chamber gives up little in accuracy, though serious competitors will still want to turn their necks. With a flat-base bullet with pressure ring, a loaded 6PPC round made from Lapua 220 Russian brass will measure about 0.271" in diameter. (You may want to measure your own lot of brass with your particular bullet.) Therefore, you'll want a .272" chamber neck, at a minimum, a .273" for "fatter" bullets, and for varminters, we recommend a .274" chamber neck. Going with a no-turn chamber lets you spend less time fussing with brass and more time shooting. Just fire-form the cases with a strong (but not max) load of powder and the bullets seated hard into the lands. Trim the cases to length after fire-forming and you're good to go. The 6PPC cartridge is not just for hard-core benchrest competitors. When used in a no-turn chamber it is an extremely efficient, user-friendly yet deadly accurate varmint round. And you can buy a 6PPC varmint rifle from a number of respected firms such as Cooper Firearms, E. Arthur Brown, Kimber, and SAKO. Eben Brown, who runs E. Arthur Brown Company, explains that the 6PPC is a very user-friendly varmint cartridge: "Full-length size, prime, charge with powder, and seat a bullet... sounds like what you do with any other cartridge, doesn't it? In fact, the only difference with a 6PPC is that it has to be fired once (fire-formed) to expand to its final shape and size. But even fire-forming shots produce exceptional accuracy. With my lightweight falling-block gun, I shot several 3/4" groups while fire-forming at 100 yards, with my best group at nearly half-inch--so the time spent fire-forming was wonderful! In the photo, the parent 220 Russian case is on the left, while the fire-formed 6PPC case is on the right. We dimensioned our 6mm PPC chamber reamer to cut a chamber that fits Lapua 220 Russian brass closely without neck-turning. 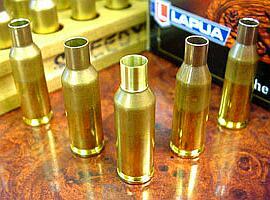 Naturally we recommend you use the Lapua brass for best results." Editors' Note: We recognize that some aspects of 6PPC tuning and accurizing remain controversial. Poll ten Hall of Famers and you can get ten different opinions on topics such as neck tension, load tuning, primer/powder choice and bullet performance. This article is a work in progress. We invite comments about any of the topics discussed herein. Acknowlegements: We would like to thank Boyd Allen, Jim Borden, Lester Bruno, Mickey Coleman, Allie Euber, Speedy Gonzalez, Brady Knight, Bart Sauter, and Zia Bullets, who all provided input on this article. However, if any errors appear, blame the editors, not them. 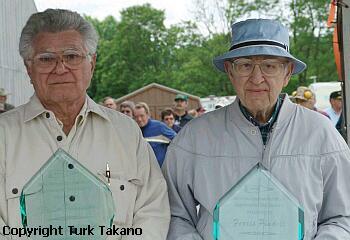 We also thank Turk Takano for granting permission to use his image of Louis Palmisano and Ferris Pindell, fathers of the 22PPC and 6PPC cartridges.